THE FIRST PEAL OF TWELVE IN THE DIOCESE. The two treble bells which are being added to the existing peal of ten at Winchester Cathedral as a memorial to the members of the Winchester Diocesan Guild who fell in the war, were dedicated by the Bishop on Saturday afternoon as they stood in the choir, before being hoisted to their places in the tower above. The bells, which are the product of the Croydon Foundry, will, when in position, complete the first peal of twelve in the diocese, and while serving as a perpetual reminder of those gallant souls from among the ranks of ringers in the See of Winchester who made the supreme sacrifice for King and country, should prove a great acquisition in forwarding the art in an area which, possessing many enthusiastic ringers, has too long been under compulsory restraint in twelve-bell ringing. This is not the first gift which the Winchester Guild has made to the mother church of the diocese, dedicated to the Holy Trinity and St. Swithin, for in 1892 they gave one of the bells - the present 2nd - to augment the previous eight to a peal of ten. The ring appears to have originated in a heavy peal of six cast by Richard Phelps, of the Whitechapel Foundry, in 1734. To these, Thomas Lester, his successor, added two trebles in 1742, thus making a peal of eight. At different times the treble, fourth and sixth were recast by Robert and James Wells, of the Aldbourne foundry. In 1891 the tenor, weighing 32 cwt., was cracked and was recast by Messrs. Mears and Stainbank, who in the following year added two trebles. Treble: ME CIVES WINTONIENSES VT LAVDES DOMINI CELEBREM DEO ET ECCLESIÆ S. SWITHUNI DEDERUNT A.D. 1892 (The citizens of Winchester gave me to God and the Cathedral of St. Swithin that I might sound the praises of the Lord.) MEARS & STAINBANK, FOUNDERS, LONDON. 2nd: AD TE DOMINE LEVABO VOCEM MEAM ME S. SWITHUNO DEDIT PVLSATORVM IN DIOCESI WINTON GILDA A.D. 1892. (To Thee, O Lord, will I lift up my voice. The Winchester Diocesan Guild of Ringers gave me to St. Swithin’s) MEARS & STAINBANK, FOUNDERS, LONDON. 3rd: R. WELLS, ALDBOURNE, FECIT, MDCCLXXII. 4th: THEDORE ECCLESTONE, ESQ., 1742. T.L. 6th: JAMES WELLS, ALDBOURNE, WILTS. FECIT 1804. 7th: R. PHELPS, LONDINI. FECIT 1734. 8th: JAMES WELLS, ALDBOURNE, WILTS. FECIT 1814. 9th: R. PHELPS, LONDINI. FECIT 1737. The connection between Theodore Ecclestone and Winchester Cathedral is obscure. Writing upon the subject in “The Ringing World” in 1912, Mr. J. R. Jerram, of Salisbury, an eminent authority on the subject of bell history, said the appearance of the name on the fourth is somewhat of a mystery. Theodore Ecclestone lived at Crowfield Hall in the parish of Coddenham, Suffolk, and his name appears on several of the peal of eight there, which were cast by Thomas Lester in the same year as the fourth at Winchester. He was also the donor of the peal of ten at Stonham Asphall, Suffolk, the ninth of which bears the following inscription: “In this tower hung 5 bells, the tenor weighing 10 hun. 2qrs. 0 lb. In the year 1742 they were taken down and with ye addition of 3 tons 10 hun. of mettle were recast into ten att ye expence of Theodore Ecclestone, Esq., of Crowfield Hall, aged 27 years. He gave also a new frame att ye same time 1742. Thos. Lester made us all.” From this it appears that the two trebles of the original eight at Winchester, the peal of ten for Stonham Asphall and the peal of eight for Coddenham were all in the foundry at Whitechapel at the same time. Was the inscription on the 4th at Winchester a mistake, or did Thomas Lester send in error one of the bells intended for another tower? On the middle of each bell is the Winchester Guild Badge. THE GUILD’S MEMORIAL TO FALLEN MEMBERS. Winchester was the Mecca of the members of the Diocesan Guild on Saturday, when the two new trebles, placed in the Cathedral as a memorial to the ringers who fell in the war, and which make the ring into a peal of twelve, were formally opened. The bells, which have been added by Messrs. Gillett and Johnston, of Croydon, were dedicated some weeks ago on the floor of the Cathedral, so that nothing remained on Saturday but to let them be heard for the first time. It is greatly to the credit of the Guild that they have been able to raise the large sum required to carry out the scheme, and thus give the Mother Church, the first ring of twelve in the diocese. In addition, an oak tablet has been placed in the ringing chamber recording the names of the 56 fallen members, and the unveiling and dedication of this memorial was the principal ceremony of the afternoon. Members assembled from all the districts of the Guild, from Bournemouth to Guildford, and from Portsmouth to Camberley. The proceedings began with a half-muffled touch of Grandsire Caters, and then a brief service was held, in the course of which prayers were offered by the Rev. N. C. Wood (Minor Canon and hon. secretary of the Guild), and the lesson was read by the Rev. C. E. Matthews (vice-president). The Mayor of Winchester removed the Union Jack which hung over the tablet, and the dedicatory prayers were offered by Archdeacon Braithwaite, who also pronounced the Benediction, after the hymn, “Let saints on earth in concert sing,” had been sung. 1914. FOR THE COMRADES WHO DIED FOR US 1918. 1921. THE GUILD DEDICATES THE TREBLES. 1921. Canon Braithwaite said it was a great privilege to take part in that ceremony, and to have that tablet erected in their Cathedral belfry as a constant memorial of the ringers of that diocese who gave themselves for England, for freedom, and for right in the great war. He was also very thankful that there were so many ringers present that day from all parts of the diocese, and to greet them as workers in the church. The ringers were out of sight, but not out of sound, and he was sure they did a real work for God. To those with musical ears, and those who love music, what was more beautiful than to hear the sound of well rung bells, to mark the changes as they go, to follow a bell as it hunted up and down, to hear the great tenor speaking so regularly and so steadily, keeping the bells in their right places. It was music that anyone might love to hear. The clergy had a series of texts which spoke to them very clearly. One of them, in one of St. Paul’s epistles, was: “Thou that teachest another teachest thou not thyself?” Was that not also a text that applied to the ringer: “Thou that callest another to worship, callest thou not thyself?” They remembered the reason why bells were hung in their towers and steeples, not merely that they might delight in the music, but that they should hear their call, and through their ears realise that God was calling to them to serve Him and to worship Him. The Mayor made a brief speech, referring to the pleasure it gave him to take part in the ceremony, and to the delight which the sound of the bells always gave him when he heard them ringing. On the motion of Mr. Elkins, thanks were accorded to the Mayor and to Canon Braithwaite for their attendance. The ringers’ requiem, the “whole pull and stand,” with the bells half-muffled, was then rung 56 times, representing the number of men whose names are recorded on the tablet. This was the first ringing that took place on the twelve bells, and the muffles were then removed, and a course of Grandsire Cinques rung for the Cathedral evensong. Subsequently the ringers gathered for tea at St. Maurice’s Parish Hall, the Rev. W. E. Colchester, treasurer of the Guild, presiding, supported by Mr. Cyril Johnston, the Rev. E. B. James, the Rev. N. C. Hall, Mr. George Williams (Master), Mr. W. Andrews (Master of the Cathedral band), Mr. A. H. Pulling, etc. The Chairman informed the meeting that the fund for the memorial bells had been completed, with the exception of some £25 or £30, but the question had arisen of providing guides for the first six ropes. This would represent, probably an additional £12. He asked for the opinion of the gathering as to whether this additional responsibility should be undertaken. Mr. Cyril Johnston, asked to tell the meeting something about the bells, said it was not the first time his firm had been associated with Winchester. The Guildhall clock had come to them for restoration after 60 years’ work, and, on examination, he found that the clock was made by his firm. When one thought of this, one wondered how clockmakers and bell founders ever got a living (laughter), for their work lasted for generations. The first definite order for bell restoration they received after the war was given them by Mr. Colchester for the bells at St. Maurice’s, Winchester, and now they had come there again in connection with the Cathedral. He would like to congratulate the Guild upon being so well organised, and having such energetic officers and such a good spirit pervading the members that they had been able to get such a comparatively large sum of money to put up two bells as a memorial to their members who fell in the war. There had been some difference of opinion as to whether the two new bells should be tuned on the modern scientific five-tone principle, or whether they should be left like the old bells. He was more than satisfied himself with the result. His firm had given them the very best that could be given, and he hoped the ringers, with whom, after all, the decision rested, would be equally satisfied (applause). He appreciated the high honour, done to, the firm in having been concerned in the carrying out of the memorial. Mr. George Williams (Ringing Master), the Rev. E. Bankes James, and others, having spoken of the great advantage that would be gained by placing guides in the ringing chamber, it was resolved to request the sub-committee to have the guides erected. SUGGESTED RECASTING OF OTHER BELLS. 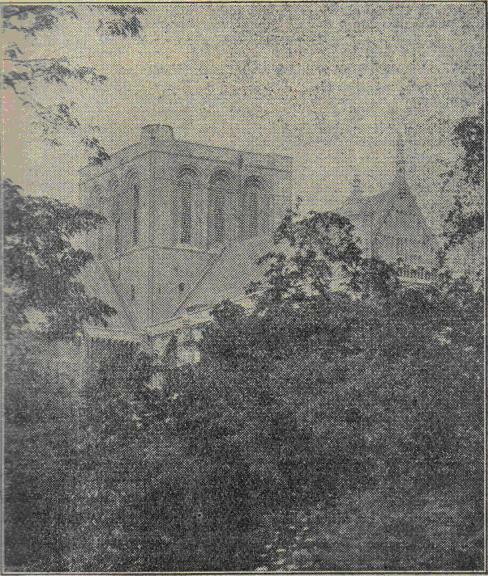 Mr. Wilfred Andrews said he hoped before his connection with the Cathedral ceased they would have all their bells attended to, for there were some they were not too proud of. He hoped it might eventually be possible to form a bell fund to have these recast. It was, perhaps, more a Winchester matter than a Guild matter; but still, it did concern them, for the Cathedral and the bells were diocesan. Those who knew the old tenor before it was cracked were of opinion that it was a better bell than the present one. The present 11th was a very good bell, and if they could have a correspondingly good tenor they would have a much better peal than they now had. Mr. Andrews added that, as representing his colleagues at the Cathedral tower, he was pleased to see so many ringers present from the various districts of the Guild. Mr. Johnston said when the order was given for the two new bells he made a sporting offer to recast the two old trebles for £50, if they could be done at the same time. Unfortunately it was not possible to take advantage of that offer, and he was, therefore, relieved of responsibility in the matter. But in view of what had been said by Mr. Andrews he would be prepared to keep the offer open until midnight on December 31st next (applause). If Mr. Andrews could walk round Winchester and find ten people to give £5 each the thing would be done (applause). It was pointed out that the 2nd of the old ten (the present 4th) was given by the Winchester Guild, and a resolution was passed supporting the committee, in the event of the additional money being raised; in giving their consent to the recasting of this bell. Afterwards the annual meeting of the Winchester District was held, at which the officers were re-elected. It was decided to hold the next annual district meeting at Romsey, and the intervening quarterly meetings at Alton, Cheriton and Titchborne, and Dibden and Fawley. A vote of thanks was accorded to the Cathedral authorities. Further ringing at the Cathedral subsequently took place, and the beautiful peal of six at St. Maurice’s were also utilised. With regard to these latter, it is interesting to note that the four largest bells are about 300 years old, and that when they were taken out for restoration, it was found possible to tune them on the five-tone principle, so that the whole are now like a new peal. The evening ringing at the Cathedral included Stedman and Grandsire Cinques, and many ringers had their first pull on twelve. The founders of the bells received many compliments upon the excellent work they had accomplished, and the “splice” was regarded as a surprising success in view of the indifference of some of the bells which form the rest of the peal. WINCHESTER CATHEDRAL BELLS TO BE RECAST. NEW AND HEAVIER PEAL OF TWELVE. The ring of twelve bells at Winchester Cathedral are to be recast and increased in weight. This announcement was made to a meeting of Friends of the Cathedral last week by the Dean. The present peal is a “patchwork” affair, and ringers who know them will be delighted to hear that at last there is the promise of a worthy peal to crown this grand old pile. The project is the outcome of steps originally contemplated by the Friends of the Cathedral, who had decided to provide funds for the recasting and rehanging of two of the bells. When this came to the knowledge of Mr. F. Hopkins, managing trustee of the Barron Bell Trust, he offered, from the funds for the Trust, to provide the additional money to make a clean sweep of things, so that the Cathedral could have a new ring of twelve. The work will be carried out by Messrs. Taylor and Co., of Loughborough, and the weight of the tenor will be raised from 30¼ cwt. to 35 cwt. OFFER ACCEPTED BY DEAN AND CHAPTER. In making the announcement, the Dean said the help the Friends offered in connection with the bells had worked like a snowball. No sooner had they given the order to the well-known bell founders, Taylors, of Loughborough, to recast and rehang the two bells which had become unsafe, than they received an offer from Mr. Hopkins and the Barron Bell Trust to pay the cost of making a really good job of the bells by recasting and rehanging the entire peal and adding a new tenor bell in time for the Coronation next year. That was a magnificent offer and had been gratefully accepted by the Dean and Chapter, and they realised that the action of the Friends had put them in the position to do so. The bells would be removed early in August - he believed the work would begin the day after Bank Holiday - and although Taylors would not absolutely guarantee that they would be completed in time for the Coronation in May next year, they had every hope that it would be possible. The present bells appear to have originated with a heavy peal of six, cast by Richard Phelps of the Whitechapel Foundry in 1734. To these Thomas Lester, his successor, added two trebles in 1742, thus making a peal of eight. The agreement for the ring of bells cast by Phelps is still in existence. It shows that the Dean and Chapter were to send to the foundry old metal of the weight of approximately five tons, which was about the same weight as the new peal. It is assumed that the old bell metal was that of an earlier ring of six bells, put in late in the 17th century, as it was in the year 1634 that the tower was closed in. The agreement provided that Phelps was to allow only 24s. less per cwt. for the old metal than the cost of the new. The tenor bell, it was stipulated, was to be agreeable to the note of the organ of St. Michael’s, Cornhill, which was taken as the standard at that period. Of the bells cast by Phelps in 1734, only one, the present 9th, remains. The present 11th was recast by him in 1737. At different times the old treble, 4th and 6th of the eight were recast by Robert and James Wells, of Aldbourne, the treble in 1772, and the others in 1805 and 1814 respectively. In 1891 the tenor became cracked and was recast Whitechapel, and in the following year Mears and Stainbank added two trebles to make a ring of ten, the treble being given by the inhabitants of Winchester and the second by the Winchester Diocesan Guild. The 5th of the ten, cast by Phelps in 1734, cracked in 1903 and was recast at Whitechapel. The present trebles, making a peal of twelve, were added by the Winchester Diocesan Guild as a memorial to the members who fell in the Great War. There is something of a mystery about the present 6th. Its inscription is “Theodore Ecclestone, Esq., 1742. T.L.” Theodore Ecclestone was a wealthy patron of bells and bellringing, and a ringer himself. His home was at Crowfield Hall, in the parish of Coddenham, Suffolk. He gave several of the bells to this church, as well as being the donor of the peal of ten, at Stonham Aspal, Suffolk. That he ever had any connection with or interest in Winchester there is nothing to show. But in 1742 it would appear that the two trebles to make the ring of eight at Winchester Cathedral, the peal of eight for Coddenham and the ten for Stonham Aspal were all in Thomas Lester’s foundry at Whitechapel at the same time. Did Winchester get the wrong bell, or was the inscription a mistake on the part of the craftsman? Those who remember the old ring, of mixed age and quality, will find in the new peal a revelation of the modern founder’s art, something entirely satisfying in its tonal qualities and robustness. Founders to-day are able to produce bells of deeper note and finer qualities with less metal than their predecessors, thanks, of course, to the tuning methods which they now apply, by which the whole bell contributes to the purity and perfection of the tone. In these days, indeed, there is no need for peals of excessive weights to produce all that the critical ringer can desire. There are, perhaps, a few ringers, who like to think of tenors in tons of metal, who will disagree with us when we say that in these days peals up to forty hundredweight are sufficiently heavy for all practical purposes. We know that modern hanging can make much heavier bells peal able single-handed, by a handful of men of exceptional strength and skill, but with the present high state of craftsmanship in turning out perfect bells, peals of the size and weight of Winchester or thereabouts are amply satisfying both from the average ringer’s and the public standpoint. Do not let it be thought that under any circumstances we deprecate the installation of heavier bells, but the circumstances need to be very exceptional to justify it; and when it comes to putting in a peal with a four ton tenor, as is contemplated in Liverpool Cathedral, we confess we can see little practical purpose if general use is to be made of the bells as a ringing peal. Bells considerably more than twice the weight of Winchester, tuned under modern conditions, will, we feel, prove something of a “white elephant” from a ringers’ point of view. THE NEW PEAL AT WINCHESTER CATHEDRAL. Bishop and English People’s Love of Bells. Amid civic pomp and with inspiring religious ceremony the new ring of twelve bells at Winchester Cathedral was dedicated and opened on Saturday. The Mayor and Corporation of the City attended the service in State, and the Lord Bishop, supported by the Dean and Chapter, the Honorary Canons and a large number of other clergy, performed the dedication. Many hundreds of ringers, Friends of the Cathedral and citizens of Winchester were present, and the impressive event will long leave pleasant memories with all who were privileged to share in it. THE CENTRAL TOWER OF THE CATHEDRAL. The small windows under the Louvres light the Ringing Chamber. [Photo by F. E. Dawe. The great scheme for the recasting of the bells was carried out by the generosity of the Friends of the Cathedral and the liberality of the Emma Barron Bell Trust. At first it was intended only to rehang the old peal, but the larger scheme was eventually decided upon and it has been carried through to a highly successful conclusion. It was found possible to retain the old frame, part of it put in with eight bells cast in 1734 by Richard Phelps. The bells, however, have been increased in weight and the tenor now weighs 35 cwt. 1 qr. 6 lb. The present work has been carried out by Messrs. John Taylor and Co., and they have given the Cathedral a truly magnificent peal, worthy of the grand old building which for so many has been a great centre of religious life in this country. Winchester Cathedral had bells in Saxon times, and from some historical notes by Canon Goodman compiled in connection with the dedication, we find that King Canute is recorded in the “Annals of Winchester,” under the year 1035, to have given two bells to the church. Bells are mentioned on various occasions through the centuries. In 1248 “a vane fell from the tower of St. Swithun’s at the time when the evening peal was ringing.” In 1334 Prior Alexander in London ordered the monks of St. Swithun’s to assemble in church, ring the bells and sing a Te Deum, praising God and their patron saints for the happv reconciliation of Bishop Adam, of Orlton, with King Edward III. In the winter of 1630-31 a new frame for the bells was made, in view of the alterations in the tower carried out in 1634. Previously the tower had been an open lantern, now it was arched and the present ringing chamber constructed over the new ceiling. At various times between 1734 and 1936 all but two of Phelps’ bells were recast, the tenor in 1891. In 1892 two additional bells, increasing, the number to ten, were given respectively by the city and the Diocesan Guild, and two others to complete the ring of twelve were given as a ringers’ memorial of those comrades who fell in the Great War. Treble.- Gillett and Johnston Founders Croydon 1921. Sociis, qui morti se pro suis [dederunt] MCMXIV-VIII. 2nd.- Gillett and Johnston Founders Croydon 1921. Has ambo memor vovet gilda MCMXXI. 3rd.- Mears et Stainbank, Londini, fecervnt. Me cives Wintonienses vt laudes Domini celebrem Deo et Ecclesiae S Swithvni dedervnt : A.D. 1892. 4th.- Mears et Stainbank, Londini, fecervnt. Ad te Domine levabo vocem meam me S Swithvno dedit pulsatorvm in diocesi Winton gilda. A.D. 1892. 5th.- R. Wells : Aldbourne : fecit : 1772. 6th.- Theodore Ecclestone Esqr 1742 T : L.
7th.- Mears et Stainbank, Londini, fecerunt. Qinta Dei resono quas quondam tertia laudes Conflata CICICCCXXXIV Fracta recoctaq : CICCCICIII. 8th.- James Wells Aldbourn Wilts fecit 1804. 9th.- R : Phelps Londini fecit 1734. 10th.- James Wells Aldbourn Wilts fecit 1814. 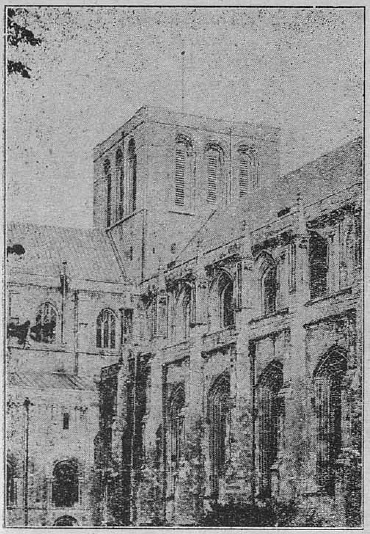 The cost of refitting this peal of Bells in 1937 was partly defrayed by the Friends of Winchester Cathedral. E. G. Selwyn, Dean. W. Andrews, Captain of Ringers. 11th.- R : Phelps Londini fecit 1737. To the Glory of God this ring of twelve Bells was recast as the gift of The Barron Bell Trust, 1936. Emma Barron, Founder. F. Hopkins, C. M. Walrond, H. W. Eldred, Trustees. Tenor.- Mears and Stainbank Founders London 1891. Horas avolantes numero mortuos plango : vivos ad preces voco : Jam Georgi Sexti1 jubeor resonare Coronam; Regis et inscriptum nomen adornat opus. MCMXXXVII. The tenor originally had the name of King Edward VIII. inscribed on it, but the words “Edwardi Octavi” have been crossed out and the words “Georgi Sexti” substituted. The service in the Cathedral was a most impressive one, and the great nave was well filled with a congregation that began to assemble an hour before the ceremony. Ringers came from all parts of Hampshire and the Isle of Wight, and others were present from the neighbouring dioceses of Salisbury, Oxford and Guildford, and even farther away still. The ringers and their friends had reserved seats on one side of the aisle and the Friends of the Cathedral on the other. Shortly before 3.30 a civic procession entered the west door. Beadles, with their maces, preceded by a burly police officer, led members of the Corporation, wearing their robes, up the centre aisle, with the town clerk and the city macebearer, followed by the Mayor, bringing up the rear. At the same time the choir passed along the south aisle to meet a procession of invited representatives. Headed by the cross-bearer and the choir, this procession passed slowly up the Cathedral. It included the officers of the Diocesan Guild of Ringers, the representatives of the bellfounders, the Friends of the Cathedral and the Managing Trustee of the Barron Bell Trust, the chairman of the Hampshire County Council and the clergy of the Rural Deanery, the Honorary Canons of the Cathedral and the Dean and Chapter. The procession moved solemnly on its way to the strains of the ringers’ hymn, “Unchanging God.” At first its notes came from the choir at the west end, but soon it swelled in great volume to the high vaulted roof as the congregation joined in singing the words, so familiar at ringers’ gatherings. While the procession was slowly making its way, the Bishop, attended by his chaplain, passed almost unnoticed to his throne. Far through the land o’er hill and dale. While this hymn was being sung the Bishop was escorted to a place in the choir underneath the central tower, accompanied by representatives of the donors, the Mayor of Winchester and other clergy. The Dean having requested the Bishop to dedicate the bells, his lordship offered special prayers and then pronounced the dedication. A prayer invoking the blessing of God upon all those “by whose labours and gifts this work has been done and these bells restored to Thy service,” concluded the ceremony, and as the Bishop, proceeded to the pulpit the bells rang out from the tower overhead with the Cathedral ringers at the ropes. In the Cathedral it was difficult to hear them fully, but the booming notes of the larger bells came down with a satisfying effect to the eager listeners below. ENGLISH PEOPLE FOND OF THEIR BELLS. In his address the Bishop of Winchester said: After an interval of many months, the Cathedral bells have once again rung out. For centuries past the bells have been rung from this great Church of God, calling people to praise and thanksgiving and prayer, and in commemoration of great events which have taken place both in Church and State. As long ago as the year 1055 there is a record that two bells were given to this Cathedral by King Canute. Since then, at various times, the bells have been changed and new bells have been given. Continuously bells have been rung from the Cathedral, but of late years from various causes bellringing became difficult here. So it was decided that the whole peal should be recast and rehung, and through the liberality of the Friends of the Cathedral and the Emma Barron Trust, which has already done so much for the bells of this county, it was possible to do this. The bells were taken down, sent on their long journey, and now they have returned home and once again we have heard them sending forth their message to the people. We English people are, indeed, fond of our bells. Throughout Christendom bells are a characteristic feature. There are countries in which bells are rarely, if ever, heard; there are lands in which the worshippers are summoned to their places of prayer either by the beating of a gong or by the call from the minaret. There are even lands in which until quite recently bells were heard; now they are silent. In Russia and in Turkey no longer are bells heard. They have been silenced by the enemies of Christianity. But in Christian lands, where worship is freely allowed, the bells ring forth their message to rich and poor. PEOPLE ARE PROUD OF THEIR BELLS. It is true there are some who from time to time complain of the ringing of bells. The Bishop, I suppose, is the first to hear such complaints, but those who make those complaints are not speaking for the great mass of the people. The majority of the people of our country are proud of their bells. As long as they are rung well; as long as they are well tuned; as long as they are not rung at all hours and at unseasonable times, the people are proud and thankful for their bells. Certainly this is the case in our own county. In village after village there are to be heard good sets of bells well and faithfully rung. Parishioners take a real pride in their bells, and when sometimes bells have to be silenced for rehanging or recasting, I have heard parishioners say that during the time of silence it seemed as if their church was gone. Our bells are associated in our minds with many recollections and many memories. I think the real reason why people are so fond of their bells and regard them as so characteristic of English life is that they have so many associations. There are, of course, the historical associations, and bells had at one time an active part in the social and political life of the community, whether that community was to he found in town or in country. There are many people, too, who have their own individual reaction and associations connected with bells. Bells not only recall places, but events in their lives; you look back to moments in the past which are evoked again by the sound of the bells. But first and foremost our bells are associated with God. They speak to us of God and of the Unseen World. Even on the bells themselves there are inscriptions, as there are on these bells, speaking of the praise they offer to God. From the bells there goes up to Almighty God praise, thanksgiving, intercession and petition, and as the bells ring forth they give a call from God, to come together to worship God in His house. BELLS AND THE RECALL TO RELIGION. We hear to-day about the recall to religion, and one aspect of this recall should be a summons to those who have become careless about churchgoing, to return once again to join in the weekly corporate act of prayer. As you listen to the bells, calling you to come with your fellows and to worship God, calling you to come, with Christians all over the world, to join in praise of the Most High, that is one of the messages which they are seeking to give us all. They are calling also to the individual in his everyday life. The rush of life is so great that God is often forgotten in the clamour and noise around us. Amid the distractions of daily life the bells ring out with their message to us, whether in the fields, or whether in places of business, in shops or in the streets, calling us for just a moment to think of God and his claims on our life. When you hear these bells or the bells of your own parish church ringing out, sometimes on a weekday as well as on Sunday, if you are not able to respond by going to church, at any rate for a moment think of God; think of Eternity. I think the bells, especially in these days, give us another message. Bells are often associated with peace; I suppose it is because so often they have been rung at the declaration of peace. The bells which have been ringing this afternoon are wrought of the metal which must have rung on various occasions in the past when peace at last has come to an anxious nation. Bells are associated with the call to peace. The world needs peace; but the world seems to be drifting towards war; statesmen and people seem almost powerless in the face of a doom that seems to be hanging over mankind. Man is failing; but where man fails God can succeed. The world is shuddering and shaking and trembling to-day because it has so largely forgotten God. Without God we cannot have permanent and righteous peace; with God in the hearts of individuals and ruling over the destinies of nations peace can come. So, sometimes, when the bells ring, offer up a prayer for peace; pray that the statesmen of the world may be guided so wisely that the peril of war will fade; pray that people of the world may be filled with the passion for peace - for righteousness and peace; pray that God may give us all that peace which He alone can give, the peace that passeth all understanding. The service ended with the hymn, “Now thank we all our God,” and the Blessing, pronounced by the Bishop. The collection was on behalf of Winchester Guild and the funds of the Friends of the Cathedral. As the congregation dispersed the Cathedral company rang the bells in a touch of Grandsire Cinques, which gave visitors the opportunity of wandering into the Cathedral Close and listening to the new peal. The only criticism which was offered was that the shuttering up of the belfry windows had been rather overdone, but we understand they remain as they were with the old peal. Certainly the residents round about the Cathedral will have no cause to complain of excessive noise. In the city streets the bells can hardly be heard. In the ringing room the bells are a little noisy, but that will be remedied when the “trap” in the ceiling has been sealed down again. Visiting ringers and their friends were entertained to tea in the City Hall, and in the evening when the bells were open for ringing scores of ringers flocked to the great ringing chamber - nearly 40ft square - and tried their hand at the bells. Many rang on twelve for the first time, and, as is often the case on such occasions, some of the ringing was indifferent. However, many courses and touches of Stedman Cinques and courses of Grandsire Cinques were brought round, and an excellent course of Double Norwich showed up the back eight to great advantage. Everyone was delighted with the bells, which are a well-balanced and really noble peal.